Search for NBA Tickets here on SeatGeek.com! The SeatGeek team presented for 700 other New York City tech followers, entrepreneurs, and developers at the May 2010 NY Tech Meetup at FIT’s Haft Auditorium. 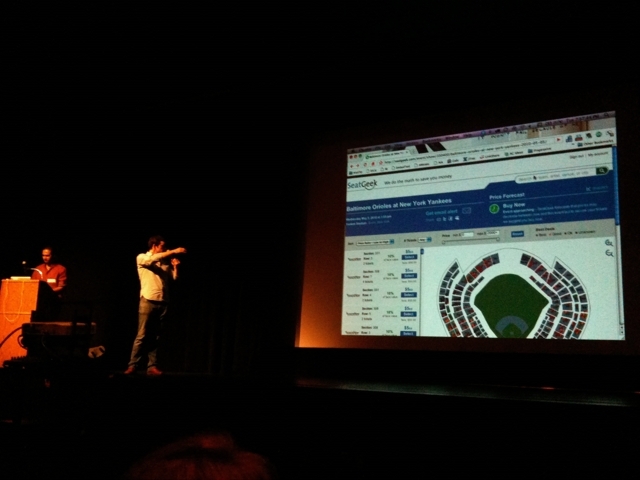 We are very excited that we were able to demo our sports and music ticket forecasting and search site. In case you missed the demo, we went through the process of searching and buying tickets for your favorite sports team or musician. SeatGeek automatically generates forecasts on ticket prices, allowing our users to be smart about buying tickets – saving a lot of money in the process. Goodcrush (@goodcrush) is a dating service / matchmaker for college campuses. They have also recently spun-off a chat-roulette-esque service for college students called RandomDorm. GameChanger “…provides free iPhone scorekeeping and statistics management tools for youth, high school, and college baseball and softball teams.” We really enjoyed their demo and it was great to hear that they already have 6,000 users. One interesting use case: With future social integration, a high school baseball player could hit a home run and notify his friends about it via a Facebook status update even before he has rounded the bases. Note: GameChanger also wrote a nice summary of the May 2010 NYTM. Bit.ly continues to lead the way in url shortening and analytics. They demoed their latest release and you should really check it out if you have not yet. Super intuitive UI lets you shorten, manage, and track your efforts across the web. If you are not familiar with Bit.ly checkout in depth discussions of Bit.ly on Mashable. Identified drives connections between prospective job candidates and companies. Currently it is in private-beta among Stanford students and alumni. Stickybits is a “fun and social way to attach digital content to real world objects” and provides endless use cases both personally (scavenger hunts, money tracking, etc.) and professionally. We had a great time at the event and would like to thank everyone involved. I will see you next month at the new NYU location for NYTM. For additional information on the venue change see The NY Tech Meetup Says Goodbye to FIT. For another summary of the meetup, read Last Night’s NYC Tech Meetup which has a great discussion of GameChanger. Reach out to us on Twitter if you want to meet in person at a NYTM event. I will be at most of them moving forward, so you can also get in touch with me on my personal Twitter.